At last – the first Orange Tip! Although some other butterflies may be seen early in the year, the season really starts for me when the first Orange Tip arrives. I also had my first Holly Blue – it’s wonderful what a bit of sunshine will do. The Orange Tip is a lovely little butterfly – and I mean little: it is smaller than the Small Tortoiseshell, Peacock etc., though bigger than some of the blues. The male has a very pronounced orange tip to the upper wing, but the female is all white on the top side. Both, however, are mottled underneath on their hind wings, as you can see in the phto below. The caterpillar is often found sitting along the tops of seedheads during the day. Left: Orange Tips mating. Right: Orange Tip caterpillar. There are several food plants for the Orange Tip caterpillar you can easily grow in your garden. A good wild flower is garlic mustard, or jack-by-the-hedge; this is a bienniel: i.e. it comes up one year and flowers the next, then dies. Mine are just starting to flower now, but by July or August it will have gone, leaving room for later-flowering plants. The one thing I would say is that when you clear the dead plants away, they may have chrysalises on them (and you’ll never spot them) so if possible, tuck them out of the way somewhere and leave them there until next spring, rather than composting or binning them – the butterfly stays as a chrysalis all through the winter with the adult emerging in April/May. Garlic mustard will seed itself fairly copiously, but the plants are easy to pull up. There is a second wild flower they use a lot: cuckoo flower (cardamine pratensis). This needs a fairly damp environment, and also goes back below ground early in the year. It is smaller than the other plants mentioned here: only 10-12″ high (25-30cm). 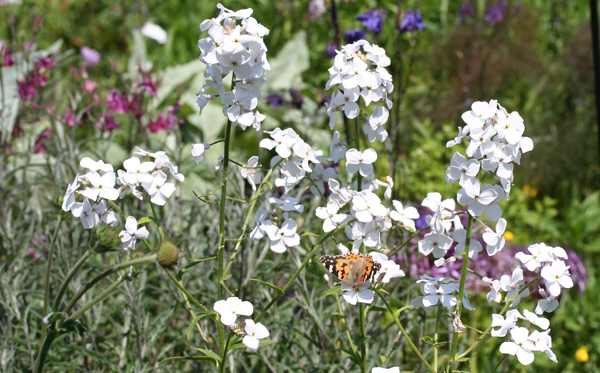 A good garden plant is Sweet Rocket (not the herb – you are looking for hesperis matronalis), which I’ve featured several times in this blog. It’s very pretty, the flowers lasting for weeks, and it usually survives 2-3 years. It is easy to grow from seed, but if you have got a plant of it, have a look at it in autumn, and you will often find some of the stems have flopped over, and where this has happened little plantlets have formed. Remove these plantlets and they will grow: if you can give them cover, your success rate will be very high, but even if you have to leave them outside, a little bit of cover will allow a good proportion to survive. I put some in the vegetable garden one year, put a cloche over them, and about half got through the winter. Pot up the rooted plantlets and you will have flowers the same year, though the plants will be bigger the following year. The other garden plant to try is honesty. 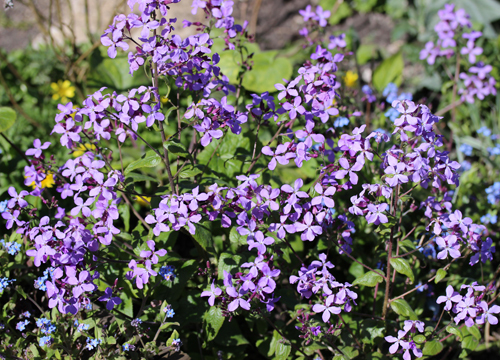 I never had much luck with honesty until I discovered one called lunaria annua ‘Corfu Blue’. 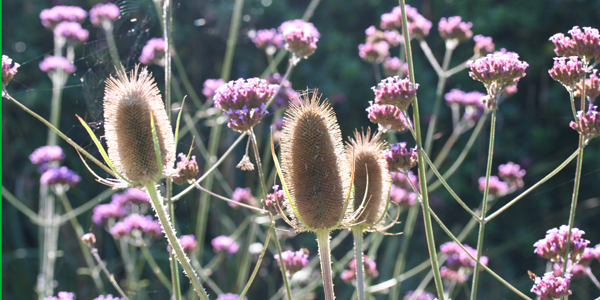 Despite the “annua” in the name, it is a short-lived perennial, and it is easy to take some of the seeds and germinate them in the autumn for the next year. Don’t be fooled by it being called blue – it is buer than most honesty, but not really blue – fortunately, it has lots of flowers to make up for it. Woodruff – foodplant for several moth caterpillars and brilliant in the garden: I’ve even got some growing at the foot of a leylandii hedge, where little else will survive. 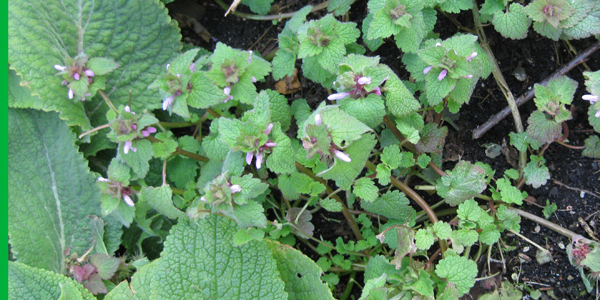 Red dead-nettle, for very early nectar – the photo below was taken on 18 Feburary this year. White deadnettle for bees and caterpillars – and because I like it! Garlic Mustard (also known as Jack-by-the-hedge and many other common names). Caterpillar foodplant of the Green-veined White and the Orange Tip. It dies down by mid summer, so it’s out of the way. When people say they want to attract more butterflies to their garden, they are nearly always talking about the adult stage of the insect – the one we see flying around in the sunshine (remember sunshine?). In a small garden, attracting the adults may be all you can sensibly aim at, providing them with nectar-rich flowers to give them energy to fly around and mate, which is very well worth doing. It is good if you can, though, to also provide some plants which will serve as foodplants for caterpillars. I can hear you all groaning at the idea of having to have a garden full of nettles – quieten down! Nettles are good if you can accommodate them, but the butterflies are quite fussy about the nettles they use, which need to be in a sheltered, sunny position, so it’s not as easy as leaving a few behind the shed: do it if you can, but don’t worry about it if you can’t. What you do have to do, though, is accept that the holes left in the leaves by the munching caterpillars will be visible – but what are a few holes when you’ve had the fun of watching the munching? Sweet rocket/honesty/lady’s smock for the Orange Tip and Green-veined White. Sweet rocket is very easy, comes in white or purple, and lasts for 2-3 years. You could also grow garlic mustard, a native wild flower which blooms early and has disappeared by the middle of summer – I’ve got some in the garden, and I can find caterpillars on it or my sweet rocket most years. Holly and ivy for the Holly Blue, which uses both, at different times of year, for it’s egg-laying. You will struggle to see the egg or the caterpillar, though, so look out for the female flying around the bush. Buckthorn for the Brimstone: this is a shrub and not very exciting to look at, but it does provide nectar in its flowers and berries for the birds, as well as leaves for the Brimstone butterfly, which is said to be able to find buckthorn from a considerable distance. There are two types of buckthorn, and you need to use the one which is good for your soil: purging buckthorn for chalky soils and alder buckthorn for acid soils. British native grasses are also good – I’ll cover them in more detail in another post, as well as plants for moth caterpillars. I’ll give the latin names of the flower plants I’ve mentioned here, in case you have difficulty identifying them by the common names, which tend to be different in different parts of the country: Sweet rocket – hesperis matronalis. Honesty – lunaria annua. Lady’s smock – cardamine pratensis. Garlic Mustard (also often called Jack-by-the-hedge) – Alliaria petiolata.